Gracie joined our family on 12/10/05, not too happily I must say. We adopted her from a rescue when our first Basset, Louie, was 1 year old. Gracie was 1 month shy of her 4th birthday. We figured he needed a friend so we started looking online. I immediately fell in love with Gracie, it was something about her eyes that just drew me in. My husband, Jim, and I took Louie to meet Gracie at her foster home. Gracie wanted nothing to do with any of us! The first time I saw Gracie she was walking happily through the familyroom, but then she saw us and dropped to the floor and army crawled out of the room. She spent the whole visit peeking around the corner at us. We decided to adopt Gracie and her foster Dad tricked her out the door by putting a leash on her. She thought she was going for a ride. She happily ran out the door and he happily put her in our car and closed the door. While filling out the adoption forms, I looked at the paperwork that came with her from her original owners and she came from the same breeder as our Louie did – in fact they are related! So, this adoption was meant to be, after space all, she was already family! Well, the ride home wasn’t pleasant. Louie sat happily next to Gracie. Gracie had such a frown on her face and she would growl at poor Louie. She still wanted nothing to do with any of us. When we got home, she ran inside, found the couch and jumped on it and didn’t move for over 24 hours. No potty break, no food, no treats, no water, no moving from her spot on the couch… nothing. We decided we would just ignore her and let her make the first move. She finally did come around, on her terms. We realized that Gracie needed to love us before she would let us love her. She was afraid of strangers, new surroundings and even flies. But at home, she ruled the roost. 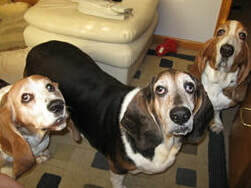 She was the ambassador for the other Bassets to get their treats in a timely manner. Gracie would do laps around the familyroom table, each time stopping and looking at either my husband or I, as if she was telling us it was treat time. She would stand in front of the treat cabinet and bark. She would do a little dance on the kitchen tile floor so that we knew she was excited and waiting for her treat. You could not even mention the word ‘Pupperoni’ in the house or near her or Gracie would just go wild. Gracie’s tail wagged from the moment her eyes opened to the moment she fell asleep. I’ve never seen such a happy dog. She loved to sit on patio chairs and we would take a chair to events for her to sit on. She loved sitting with Jim and I around the bonfire, wrapped up in the blanket my Mom made her. She loved the outside and protected her yard. She and Louie were always walking the perimeter of the yard to make sure it was ‘secure’. We had lots of nicknames for her. There was “Grace Kelly” because she had such a regal pose. “Tiny Dancer” because she danced away for treats. “Grace Face” because one look from her would melt your heart. “Snow on her nose” because she would always come inside with snow on the tip of her nose. “Miss Long Nails” because she HATED to get her nails cut. 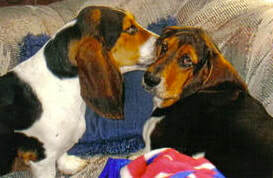 “Missy” when she was giving us Basset-tude. She wore a matching collar and harness that was seafoam green with little sea turtles on it. We had gotten it for her at the Humane Society in Maui. It was her ‘my Parents went to Hawaii and all I got was this lousy harness’ gift. She looked so adorable in them and she received compliments where ever she went. 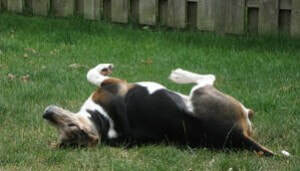 She loved belly rubs and loved just to be with us. She loved her walks with her brother Louie and it was always a race to see which one got to a tree or bush first. They loved each other so much, perhaps they knew that they truly were related. 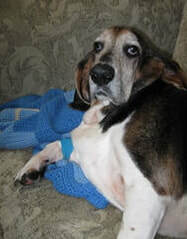 When Gracie left us in December 2009, she had been with us for exactly half of her life, plus 2 weeks. I found comfort in knowing that at least the second half of her life was filled with love and comfort. Louie was so depressed after Gracie passed away, well, we all were but poor Louie would stand in the living space room by himself and just cry and cry. He still occasionally does this now. Recently I was watching a video clip of her and she barked in the clip, Louie heard her bark and immediately ran to the hallway looking for her. Gracie loved sleeping under the covers. At night, she would paw my shoulder and out of habit, I would automatically lift the blanket so she could go underneath. She would then do a few circles and plop herself down so that the whole bed shook. Then, like clockwork, she would let out a very loud sigh, like she was just ‘deflated’. I would then fall back asleep. Even space though our baby girl has been gone for over a year now, sometimes at night, I still wake up thinking I felt her paw on my shoulder. I so wish I could lift the blanket for her and to hear her sigh again.